Title: Untitled (cellphone) from the series Cameras, Cellphones and Hard Drives, an exhibition at Gallery 1C03, University of Winnipeg, Canada, September/October 2006. 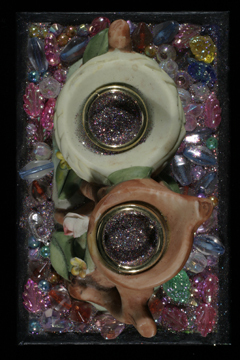 Medium: acrylic, beads, gold rings and ceramic vessel on gessoed MDF board in wood frame. Notes: This is an imaginary cellphone.